When the whole plant is harvested and processed, there are over 25,000 Uses of Hemp, and it’s known to be a very profitable crop to boot. Hemp has become more accepted as an agricultural crop worldwide, and is shedding its association with its controversial cousin, marijuana. India has a rich cultural and religious history with hemp. It was used as medicine and for producing textiles, and now it’s making a comeback. The Uttarakhand Government has implemented new laws that will open doors for industrial hemp cultivation. The crop will be used to produce medicine, textiles, food products, paper and building materials. 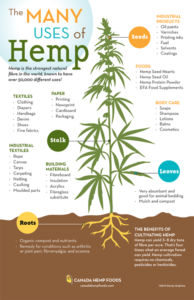 Hemp is an incredibly versatile crop that can boost local and global economies.